I haven’t had a lot of time to eat breakfast lately. I usually wait until baby J is asleep and then I run into the kitchen and grab something that’s easy to eat, fast, and filling. Some days it’s yogurt topped with granola and other days it’s a bagel with cream cheese. While prepared foods are fine I’ve been missing homemade breakfasts. 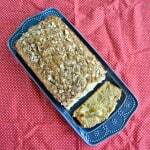 One of my favorite homemade breakfast items is baked oatmeal. I’m not a huge fan of regular oatmeal but I really like baked oatmeal. The texture is so much better then regular oatmeal and I like that I can pick it up with my hands and eat it. It’s makes it a great breakfast that I can eat on the go or that I can pick up and eat while I’m holding the baby. 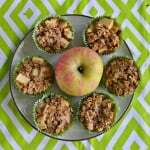 I’ve made many different types of baked oatmeal over the past few years. I’ve made berry oatmeal, pumpkin oatmeal, and blueberry oatmeal. 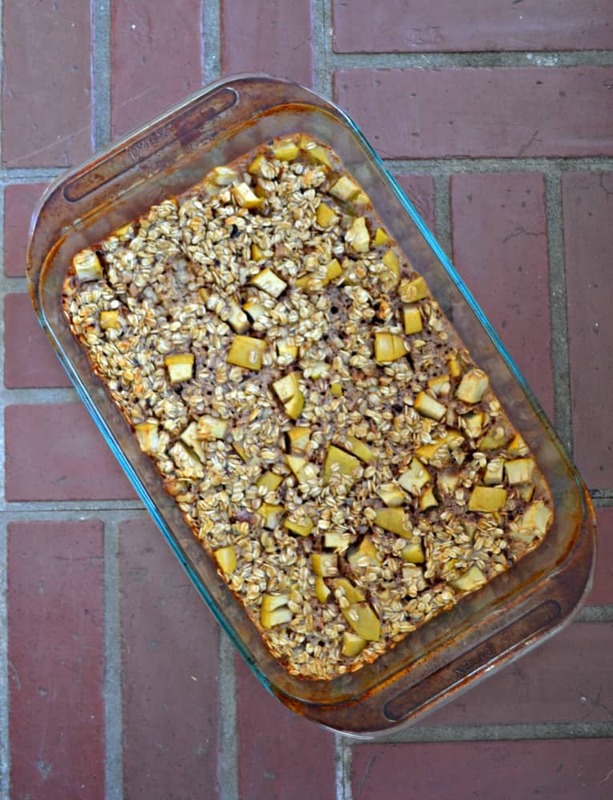 This time around I made Apple Cinnamon Baked Oatmeal because I had a bushel of apples sitting on my counter. I made the base of the oatmeal the same as many of my recipes and then just added in the apples, some cinnamon, and pecans for crunch. It smelled like fall in my kitchen as this oatmeal was baking. When it came out of the oven I let it cool, cut it into 9 rectangles, and put it in a container in the refrigerator. The great thing about this oatmeal is that I can make it Sunday night and eat it all week long for breakfast. I can pop it in the microwave, put it on a paper towel, and then enjoy it in the car or at the table. The baked oatmeal is sweet, spiced, and really filling. 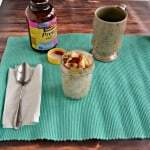 It’s the perfect on the go breakfast! 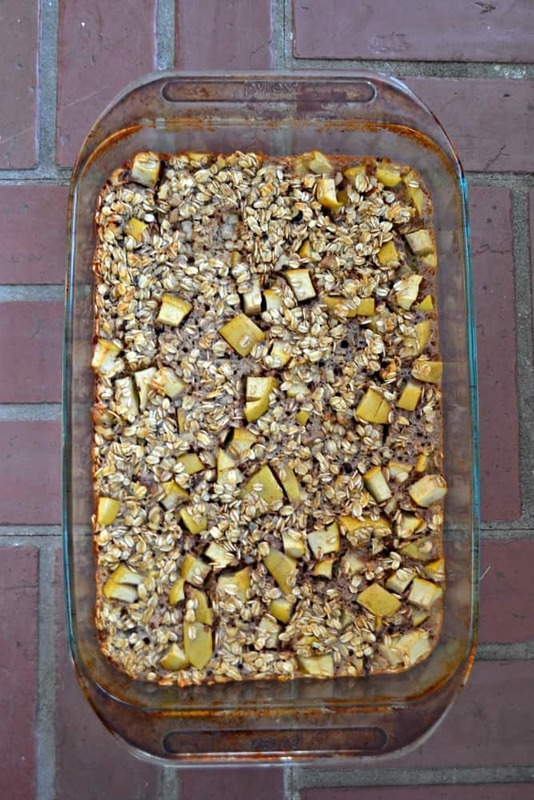 A delicious sweet and spiced baked oatmeal with apples. Preheat the oven to 375 degrees. Spray a 9 x 13 pan with baking spray and set aside. 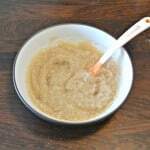 In a bowl combine the oats, baking powder, sea salt, cinnamon, and brown sugar. Set aside. In a large bowl combine the eggs, vanilla, and milk. Mix well. 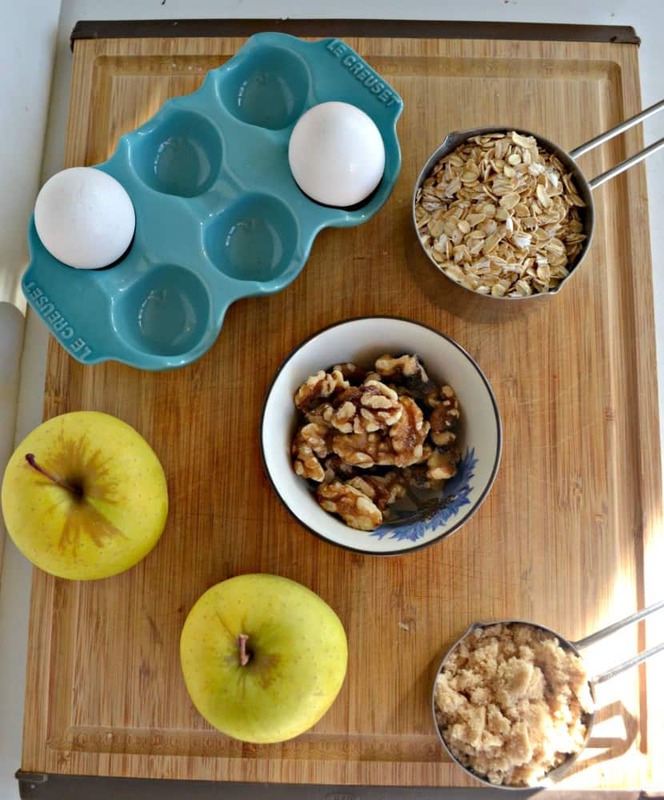 Fold in the pecans and apples. Pour into the prepared pan. Bake for 30 minutes. Remove from oven and cool completely. Cut in to 9 pieces and enjoy.